Stop holding your breath, Jon and Ghost aren't going to be reunited anytime soon on "Game of Thrones"
Jon Snow has been having a rough time this season (every season?) and could use some comforting from his bestie, Ghost. But his direwolf has been nowhere to be seen as of late. Even worse, it appears we aren’t likely to see Ghost anytime soon. And there’s a totally logical explanation behind Ghost’s absence, but we still wish he’d come around more. Season 7 of Game of Thrones has been particularly epic. There was the loot train attack and the recent battle against wights/White Walkers. Plus, the dragons have really taken flight this year. So it should come as no surprise that some of our favorite characters have been somewhat pushed out of the picture. Like Ghost, the direwolf belonging to Jon Snow (Kit Harington). We haven’t seen him since Season 6, when he was sitting by as Jon came back from the dead. But Arya (Maisie Williams) got a very short reunion with her direwolf Nymeria this season, so why hasn’t Ghost also made an appearance? It comes down to time and money. "One reason we haven’t seen the direwolves more often is that the producers set a high bar for visual realism on the series and ultra-large wolves are difficult to render convincingly," Entertainment Weekly's James Hibberd wrote, addressing the direwolves more broadly after Nymeria's return. "A naturalistic furry animal takes more time and resources to create using computer effects than a fantastical scaly dragon." That’s exactly what happened with Ghost and the Battle of the Bastards. Jon’s BFF was supposed to appear in the Season 6 showdown but was ultimately cut because of the resources it would take to animate him, according to Business Insider. Maybe by the next (and final!) 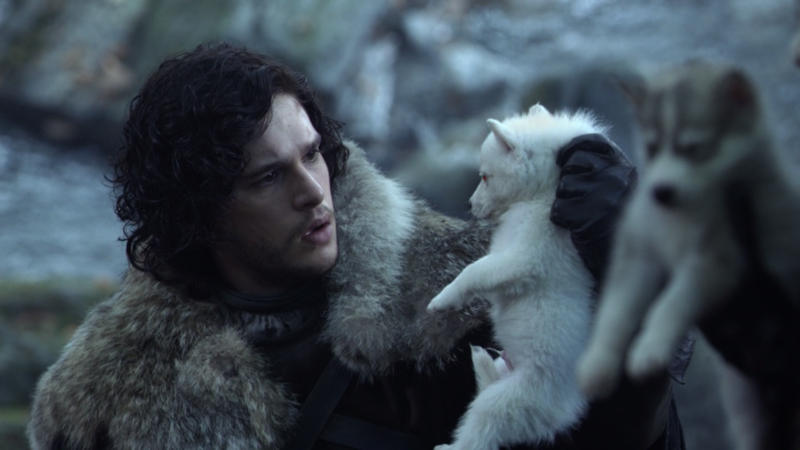 season, we’ll get to see Ghost and Jon together again — despite difficulties behind the scenes. Or, if we’re lucky, there’s the Game of Thrones Season 7 finale. At the very least, we’ll take a lot more dragons to make up for a lack of Ghost.